Eliminate Full Price: Mailbox Monday - Beauty Products Galore! My mail was fairly good. I received a lot of prizes from Allure magazine's giveaways. I cannot wait to try all these beauty products. -Neutrogena Rapid Clear Sore Pimple Gel I won from being one of the first 100 people to enter Allure Magazine's August 2010 giveaways. The price of this is $8.99. 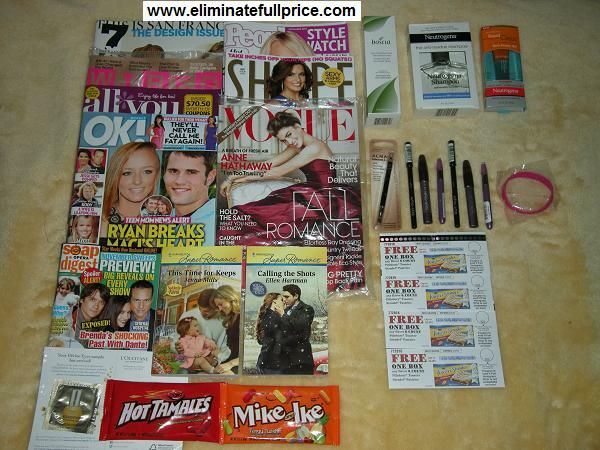 -Almay Eyeliner I won from being one of the first 500 people to enter Allure Magazine's August 2010 giveaways. The price of this is $7.49. -Neutrogena Shampoo I won from being one of the first 500 people to enter Allure Magazine's August 2010 giveaways. The price of this is $5.99. -Boscia Tonic I won from being one of the first 300 people to enterAllure Magazine's August 2010 giveaways. The price of this is $19.00. It's been over a year but they finally sent out my prizes from the 2 contests. The original prizes they were supposed to send out are no longer available so to make up for that and the long delay they sent me 6 products worth about $40 total.